I come from a family of non-traditionalists. There was the Christmas that my mom vetoed a full blown tree for smaller “interpretations” of Christmas trees scattered around the house, to the year my maternal grandmother declared that we would celebrate Christmas Eve on the 23rd (so everyone would be free of in-law engagements). 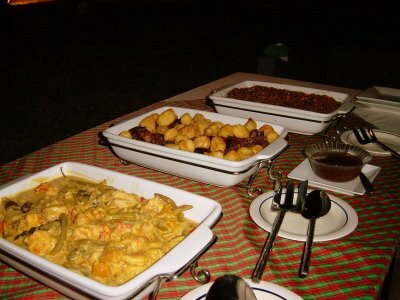 My entry for LP 5, graciously hosted by Mike of Lafang, is our December 23 Noche Buena (Christmas Eve gathering) spread. This year, to offset our very un-traditional schedule, we had traditional Filipino food. Great timing for a Lasang Pinoy entry, don’t you think? We started everything off with appetizers of crispy ukoy (fried shrimp patties) and a trio of spreads with rounds of melba toast. The spreads consisted of the following: my aunt’s yummy adobo chicken liver pate (first time I tried it and what a pleasant surprise it was! ), dulong (the tineist little fish, in olive oil with a little chili), and a chunky goat’s cheese spread. For the main event (second picture) we had vegetables and prawns in gata (coconut milk), a fork-tender and very flavorful beef kalitiran (a cut of beef…beef chuck I think) with potatoes (special recipe of my uncle’s mother-in-law), and pancit (of course!). 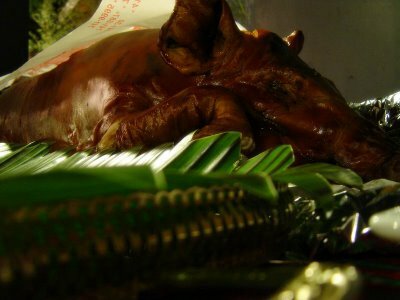 The super star of the night (as always) was the lechon (roast pig, first picture). We all waited eagerly as it was carved, greedily plucking up choice pieces of crispy skin…yum! My favorite parts are the skin and the ribs…so much flavor. All of this was served with a huge bowl of white rice, everything washed down with copious amounts of wine.On the dessert table was turon (my first ever Lasang Pinoy entry coincidentally enough, except this one was the traditional banana only variety), suman (sweet, sticky rice flavored with coconut and wrapped in banan leaves) with mango sauce, and a delicious choc-nut bundt cake (my aunt’s great discovery). After dessert we proceeded with the whole gift-opening ceremony, just as if it was really Christmas Eve (if you know my grandma, you would know that she is someone who makes her own rules about everything), with my ninong (godfather) taking charge for the gift distribution. Lot’s of kisses and hugs and thank-you’s ensued. More wine was imbibed.As we were resting in the rosy after glow of gifts recieved, warm camaraderie, and lots of wine, we proceeded to pop open the Prosecco (an Italian sparkling wine), which my uncle insisted was our in-between drink. In between what you may ask? Why, in between dinner and midnight snack of course! 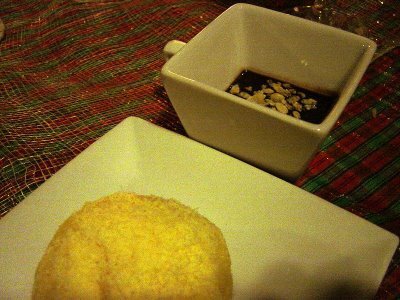 Now this is one tradition that nobody passes up…my aunt’s rich hot chocolate with ensaymada. This year she added pinipig as a topping for the chocolate. 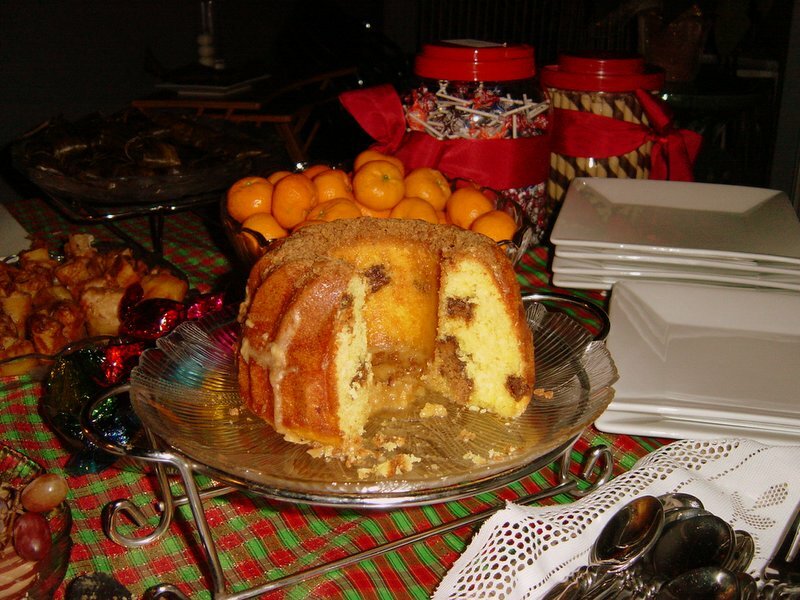 « Homemade Christmas Gifts…oh my!